If you ask 100 occupational therapists what they do you will get 100 different answers, because the nature of the profession is to help people do the things that are important to them. Every patient has their own priorities, and that makes all the stories different. Instead of focusing on the 'what' I like to focus on the 'why.' When I need to be reminded 'why' I do what I do I like to drag this story out. I knew a young family and they were unable to conceive. After spending many thousands of dollars they made some arrangement with a young teenage mom so that they could adopt her baby (just about to be born). I initially consider that the timing of such a statement that "No means not now" could possibly be related to the recent decision by the US Senate to refuse to support the Cardin-Vitter amendment that would repeal the Medicare outpatient therapy cap. Therapy leaders have been trying for many years to get the cap repealed and it was a stinging defeat. I asked for additional context and clarity about the quote and was informed that it was generally stated as an important leadership principle. The reason why this caught my attention is because of my own experience with the way that the occupational therapy profession deals with divergent opinions. In the Open Journal of Occupational Therapy this month there is an opinion paper written by Barbara Hemphill entitled Social Justice as a Moral Imperative. 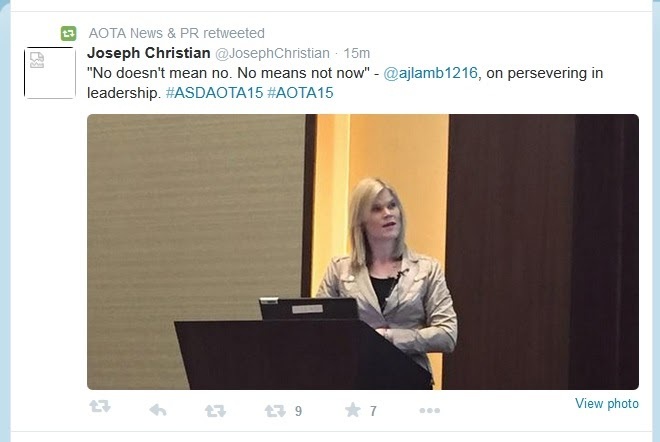 The position presented is that Social Justice belongs in the AOTA Code of Ethics, that it is embedded in the tradition of the OT profession, and that it is not a political matter. There continues to be confusion and conflation between the concepts of Christian charity and Social Justice. The author states that Social Justice is not political, but this is refuted by literature review. The originators of this movement in the OT profession have overtly stated that social justice is political (Wilcock, 1998; Townsend, 1993). This is an inarguable fact.